As the weather and the calendar clicks over into winter it's time for me to prepare my winter styling report. The seasonal report is available to my EDM subscribers and will be released in early June. To get an idea of what you might expect here is last seasons Autumn Report. Welcome to the Autumn Seasonal Report by ELK Prints. When we think of autumn colours we often think of a riot of yellows, oranges and reds. Streets and woodlands in flaming colours, pumpkins and harvest grains. For my Autumn Seasonal Report I've taken my inspiration from a softer palette. I think autumn in Australia is more subtle, we still experience all those beautiful autumn colours but they are punctuation marks in the landscape amidst the native evergreens. I created this woodland vision as a launch piece for my brand. Showcasing my woodland watercolour styling pieces collection I collaborated with some other fantastic vendors to put together a bridal dessert table. A close up of the Gien 'Sologne' cake platter featuring a deer. The colour palette for this party are soft delicate pinks and peaches with plenty of natural timbers. To create this look pick pieces with natural colours, a cream base is preferable to a white base as it will give the styling a more authentically natural look. The rawness of timber is great to use for a table but if you don't have this kind of table you can select a rustic linen tablecloth instead. Next add plenty of creams and off-whites, soft pinks and peaches and a little bit of a soft duller green to complete the look (avoid using the bright lush greens from the tropical party, the look you want here is rustic and autumnal). The china I selected for this photoshoot is by Gien, a French company that makes some really beautiful china. The pattern is "Sologne" designed by Estelle Rebottaro and features assorted wildlife from the lakes and woodlands. Look for textures that are small and delicate, tiny pine fronds, clusters of little berries, wispy threads, feathers and wild grasses. Layer the contrasting shapes and textures tightly together to get that wild autumn woodland look. The naked cake that formed the centrepiece for the photoshoot was a delicious lemon and coconut layer cake created by Two Sweet Figs using flowers supplied by Flowers by Teresa who also supplied the two bouquets used for the table. The other sweets were by One Sweet Chick and there were also paper flowers by Hanging Pretty. All the watercolour pieces featured in this shoot are available on my ETSY store and are an easy way to add a dash of autumn texture and colour to your autumn inspired party or event. 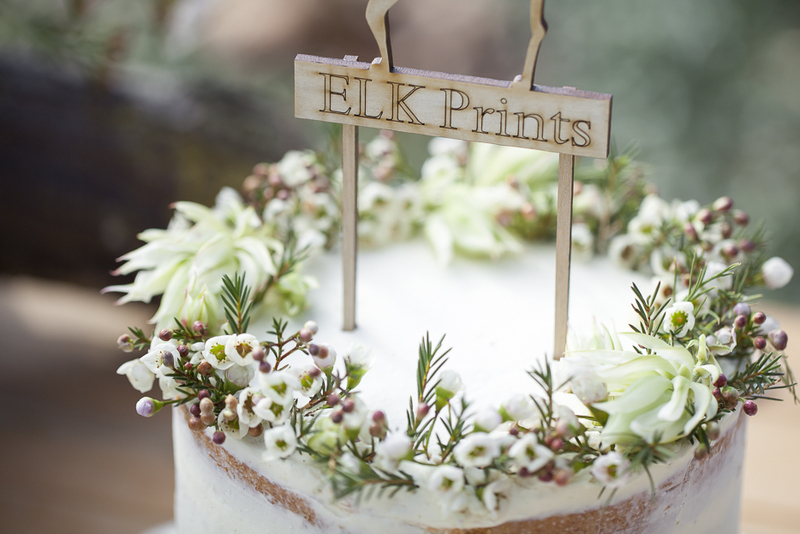 The Bridal Woodland photoshoot is styled by ELK Prints and photographed by Nikki Fitt Photography. Rich deep colours also look beautiful in autumn. This woodland party uses the same base principal as my woodland shoot - the timber table, natural colours, an off-white tone (in this case a delicate pale grey) and soft peach colours. In this party they use darker greens and a deep rich burgundy plum colour to create more depth. The copper accents on the cutlery and geometric votives create that richness we associate with autumn. Styling by Peony Art Decoration Studio. Photography by Anastasiva Belik Photography. Autumn florals might seem like a contradiction but if you are careful with the colours you select and the textures of your florals you can definitely create a look that evokes the crunch of fallen leaves as you walk through the woodlands gathering twigs. The florals should be a little wild, a little unkempt, not too bright and evoking a delicacy and fragility of a season where leaves are withering and wilting. Photography and Styling by Sweet Root Village. An Australian Whimsical Bohemian Wedding. Styling by She Designs and Photography by Lara Hotz. There is a great earthy rawness to this wedding design. The dark timbers, terracotta pots, copper light pendants and big sprays of dry green eucalyptus all evoke the cooler weather of the autumn months. The sleek modernity of the pendants contrast nicely with the rustic stone wall of the setting. Copper and Slate inspiration. Styling by East Made Event Company and photography by Love by Serena. The colours in this setting are more golden with the warm deep blonde timber tabletop matched with lemon and orange florals. A small dash of a slate grey blue works in this colour palette because it is a neutral style blue, not too bright and saturated - you need that dullness of colour to maintain an autumnal look. Ranch inspired wedding by Danae Grace Events. Photography by Cameron Ingalls. This setting mixes gold, copper and bronze metallics which together draw a familial likeness to the traditional autumn colours (yellows, oranges, reds) but in a far more sophisticated, mature and neutral way (with a dash of glamour). Loads of cream florals and plates create the bridal atmosphere and balance. This setting shows how you can use a linen tablecloth as a base for creating your Autumn table setting. The darker wood tones are brought in by the darker toned linen napkin, pheasant feathers, vintage brown glass bottles and the birch votive candles. If you loved this report then make sure you subscribe to receive ELK Prints seasonal reports at the start of each season. Newsletters are distributed quarterly so your inbox won't be swamped.